Firefox is a free, open source web browser that works on Windows, Mac, and Linux systems. It’s not my favourite browser in the world, but it has the largest library of customizable options. We’ll start out with Firefox, but if you’re really committed to the Chrome or Safari browsers we can find ways for you to move forward. Step Two: Incorporate Search Extensions. In the upper right corner, you’ll see a search box. For the most part, we usually just use that for Google. But we can add ‘extensions’ to give us direct searches for libraries, the Internet Archive, dictionaries, etc. Let’s add a few. Now that we have it installed, let’s try it out. Do a WORLDCAT search from our new extensions and add the book to your database. 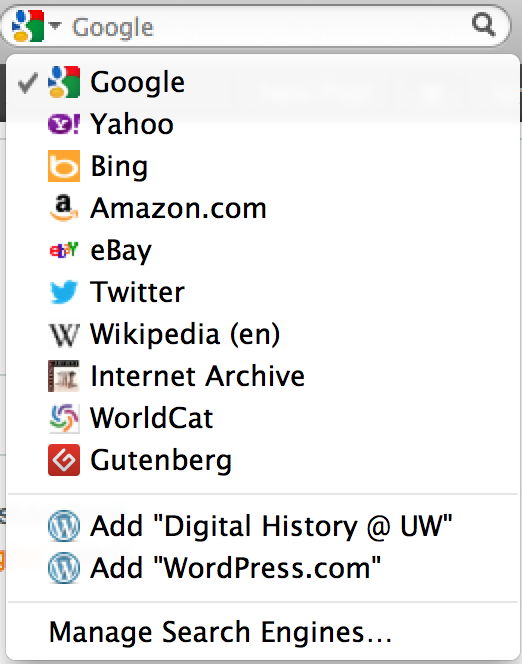 Do so by clicking on the little book icon that will appear in your search bar. Let’s do the same with a journal article. Let’s go into JSTOR, find something, and make sure we add the PDF to our database. You can also download STANDALONE ZOTERO if you want to use Safari or Chrome, and add a custom extension. Now let’s get it to talk to Word or OpenOffice. We need to install the relevant plugins. In class, I will show you how to use Zotero to make top-notch citations. This is really helpful for undergraduates especially – you’re taking tons of different classes, so you can easily use this for MLA, Chicago, APA, and other forms of citations.